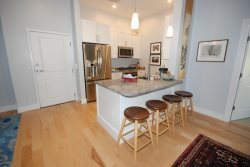 Exquisite 2 bedroom 3 bath furnished condo with extraordinary panoramic views of the islands of Casco Bay from the Eastern Promenade. Completed in 2015 condo is approximately 1,900 sf offering gourmet kitchen, hardwood floors, fireplace, and off street parking. Open floor plan features top of the line finishes, lighting, and appliances. Convenient one level living offers large living room, kitchen, and dining area. Master bedroom and guest room are separated from the main living space providing guests with a quiet place to relax. Just past the master bedroom is a den providing space to watch tv or read a good book. Condo includes central air and an elevator with a private mud room.